Keytar Bear was just pushed by other local musician. Why would anybody push Keytar Bear? She continues: Read more. 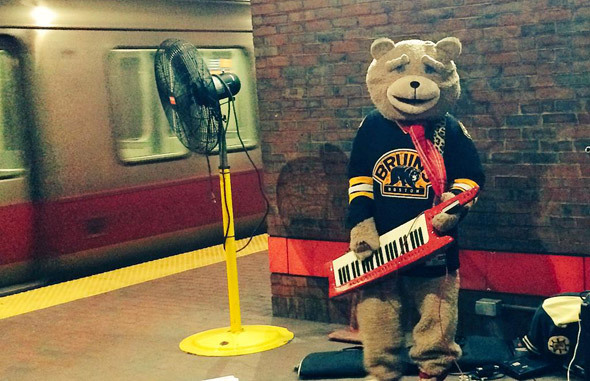 Keytar Bear to play JP; think he'll play an Orange Line stop or two first? April 26 at the Midway Cafe, along with the Space Lady, Absolute Paradise and Duck That. Chris in Boston spotted Keytar Bear on the Orange Line platform at Downtown Crossing this afternoon. Politeness Points spotted Keytar Bear on the Davis Square Red Line platform this morning. It might be Guster Day in the city of Boston (no, sir, not making that up), and they did play at South Station and in Copley Square, but the boys still found time to head over to Harvard Square play a few chords with the Bear. Boston Magazine reports on the arrests following a vicious attack outside Faneuil Hall earlier this week. There was another attack by 2 guys and a girl this time this time they tried to stab me with a knife and they stole from me lm not upset because I realize god gives us problems in order to make us stronger these are the few dollars that l recovered lm hoping my Keytar still works because l used it to defend myself but my Bruins jersey is fucked up and that pisses me off because it had everyones signature tommorows another people. Keytar Bear is making the entire place sing! He's baaaaaack. She adds that Cambridge City Councilor Leland Cheung attended with a proclamation making May 8 Keytar Bear and Abby Taylor day in Cambridge; Taylor being the organizer of the benefit. Abigail Taylor, who organized a fundraiser for the broken-nosed busker bear, reports the May 8 benefit has been moved to the Middle East on Mass. Ave. in Cambridge. The 18+ show, featuring Freezepop, starts at 7. Admission is $10. Boston Magazine gets a short video showing the performer getting sucker punched. South End Textiles came up with this design today. Vanyaland reports the furry street musician suffered a broken nose when a guy went up to him, took a selfie, then punched him in the face. That came after another attack, possibly by the same jerk, broke his keytar. Boston Magazine gets word from Keytar Bear. Steve Burns witnessed Keytar Bear meeting up with Simba the Lion at Park Street today. Keytar Pre-Bear? Nat Tarbox took this in 2012. Boston Magazine gives us an idea of the man behind the fur. Unlike other bears, he plans to hibernate over the summer. And he hates schoolkids. 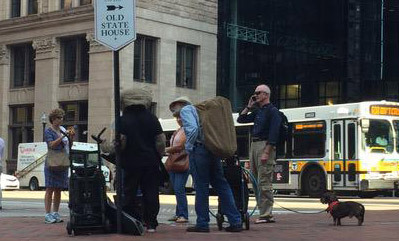 Dave Rogers spotted Keytar Bear at Government Center today. 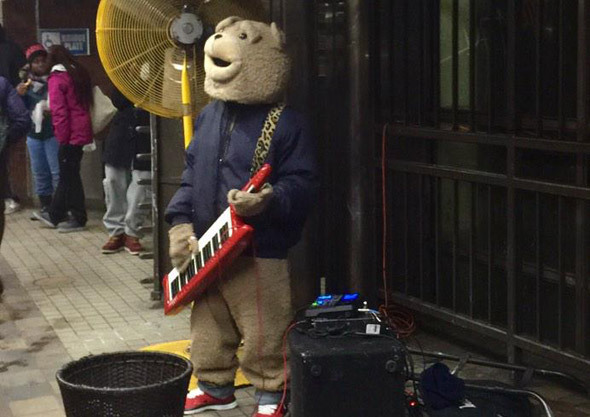 Nahani Otien reports Keytar Bear was killing it tonight at Downtown Crossing. Adrienne watched and listened to a rare paring of Keytar Bear and Saxophone Sock Monkey in Government Center this afternoon. But where does he hibernate? Keytar Bear has been making the rounds of downtown and Back Bay T stops, but he came above ground today to play and mug for the camera by the Old State House, where Jocelyn snapped his photo.